CSupt. Ronald 'Bato' Dela Rosa relieved due to Facebook post? Home / news / trending topic / CSupt. Ronald 'Bato' Dela Rosa relieved due to Facebook post? Police Chief Supt. Ronald "Bato" Dela Rosa has been relieved as brigade commander of the PNP Reactionary Standby Support Force (RSSF). This happened after he issued a stern warning against people who would harass voters and cheat during the May 9 national and local elections. 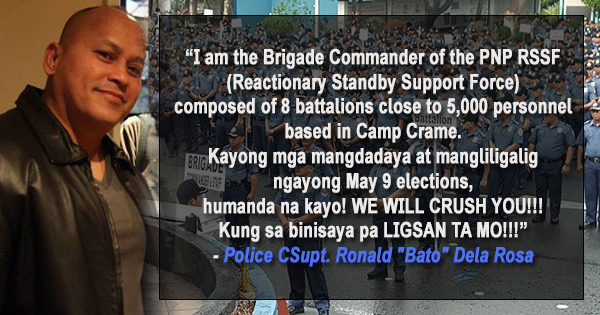 "I am the Brigade Commander of the PNP RSSF (Reactionary Standby Support Force) composed of 8 battalions close to 5,000 personnel based in Camp Crame," he posted on Facebook last Sunday, May 1. "Kayong mga mangdadaya at mangliligalig ngayong May 9 elections, humanda na kayo! WE WILL CRUSH YOU!!! Kung sa binisaya pa LIGSAN TA MO!!!" It has been said that Dela Rosa, former chief of the Davao City Police Office (DCPO), was relieved for being partisan. He was replaced by PCSupt. Francis Elmo Sarona effective Tuesday, May 3. According to a report on Bombo Radyo Philippines, the PNP denied that Dela Rosa was relieved because of his Facebook post. Police Deputy Director General Danilo Constantino said Dela Rosa, as the executive officer of the Human Resource and Doctrine Development (HRDD), has been designated to train the PNP national headquarters personnel on their election duties. Constantino reportedly added that an investigation on Dela Rosa's social media posts will be conducted to determine his possible administrative liabilities. It's a rule of thumb that military and police forces should stay apolitical at all times. Netizens however said there's nothing partisan in Dela Rosa's Facebook post. Who is Police Chief Supt. 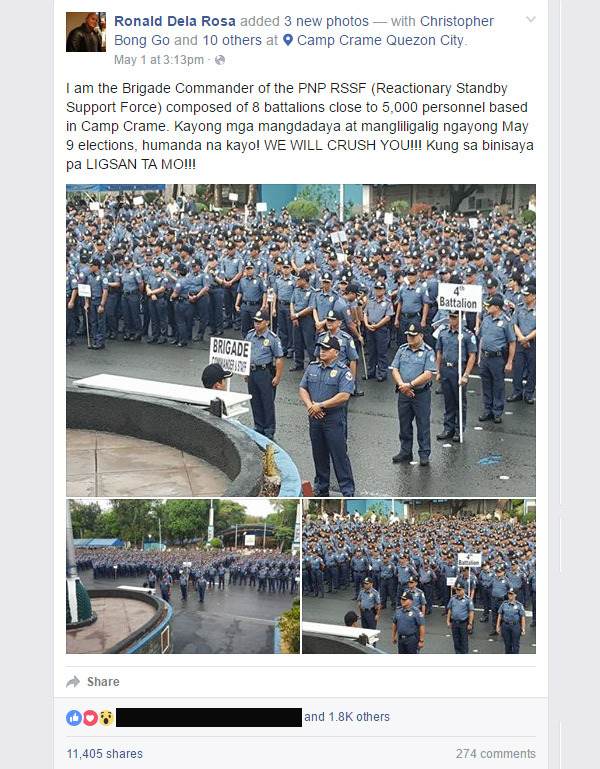 Ronald "Bato" Dela Rosa? Dela Rosa was a graduate of the Philippine Military Academy (PMA) class ’86. He served as director of the DCPO for one year and five months until July 16, 2013. He was one of the 38 police officers cited by President Benigno Aquino III during the Araw ng Parangal Sa Kapulisan for the arrest of Malaysian terrorist Mohd Noor Fikrie Binabd Hahar and wife Annabel Nieva Lee in Davao City. Davaoeños call him "The Rock" or sometimes, "Vin Diesel," but he is more popularly known as "Bato" not only because of his hard muscles but because he grew up in Barangay Bato in Sta. Cruz, Davao del Sur. Dela Rosa was responsible for reducing by almost 60 percent the circulation of illegal drugs in Davao since he took over DCPO, following Oplan Tukhang (Tuktok-Hangyo). He spearheaded the creation of ‘habal-habal cops kontra riding in tandem’ which helped supress robbery incidents on the streets of Davao. Dela Rosa also became part of news headlines in July 2013 after he led a team that rescued businesswoman Sally Chua, who was kidnapped in Quezon City. In the course of the rescue, cops shot dead her three abductors. Dela Rosa has been in the service for more than 33 years previously assigned as provincial director in Compostela Valley and then Davao del Sur.